This summer, I went to NYC where, in addition to having adventures with Molly and Sam, I also finally got my upper back tattoo finished by the talented Tm Kern, after getting it started back in 2005. Though this was the third time Tim tattooed me, it was the first session we had on his home turf. 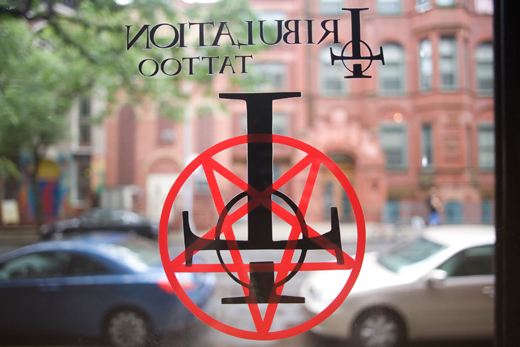 Tim’s shop, Tribulation Tattoo, is filled to the roof with art and taxidermy, so Samantha snapped away while patiently waiting the entire three-and-a-half hours the tattoo took to finish. All pictures herein are by her. Before. This is two sessions and over ten hours in. Sam sneaks a shot while Tim works. Ta-daaaa! Organic, psychedelic Rococo. Click to embiggen. Tim is some kind of genius with needle and ink! I love this! The detailing is amazing!! Is it an original design? It does look like something you’d create. Bex, I’m not sure yet! I may leave it blank. Ash, indeed it is an original design, created by me with the help of another tattoo artist, who laid down the outline. That is pure beauty what a wonderful artist he is and his studio looks gorgeous, I’d happily move in there! Finally. Thank you for bringing Tim Kern to my attention, too, Zo: can he do the same with less organic things, I wonder? Might need a trip to NY. It’s gorgeous. 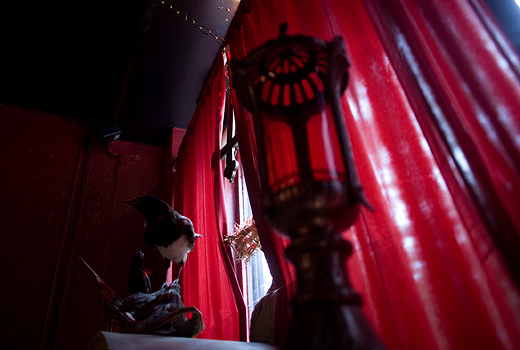 Also am inspired by the color scheme of the studio. That is AMAZING. I love it. 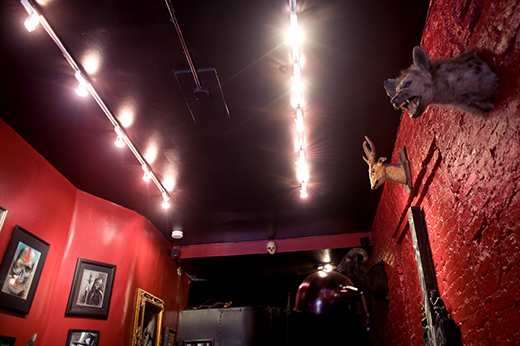 Also, the tattoo shop decor is awesome – hyena heads ftw. WOW! That is beautiful. Just when I thought you’d reached the outer limits of brilliance you post this. 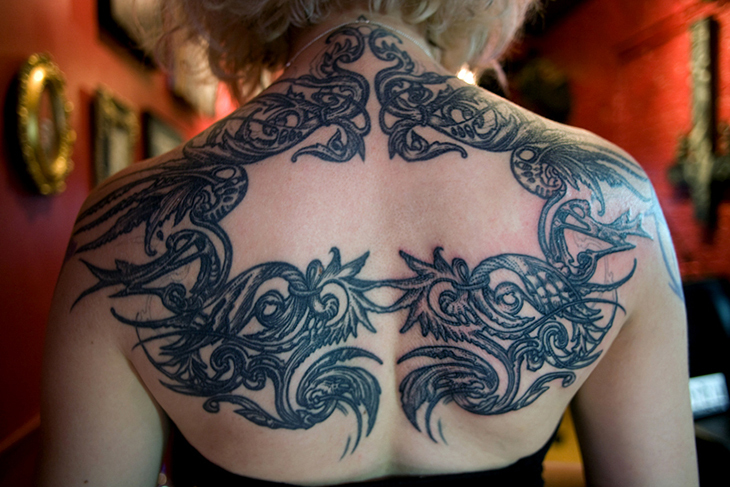 I’ve always been completely blown away by that backpiece of yours. 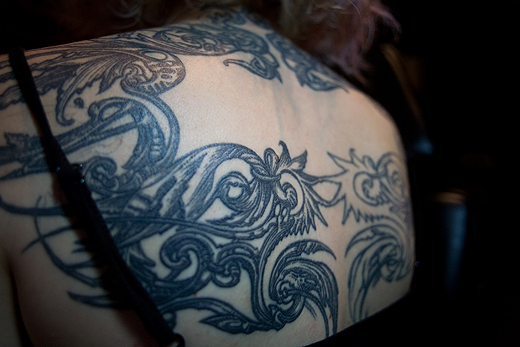 I’m a sucker for black-and-gray tattoos, too, so I love knowing that there are über-geniuses like Tim Kern around. Omigoodness! Gorgeous design, amazingly detailed. I like that you left the middle blank. I think putting something in the middle might look a bit crowded. the detail is brilliant, and i adore the negative space in the middle. It’s so beautiful, I find it hard to find fitting words. Personally, I’d leave it as is. The final piece looks amazing. I’ve had my eye on Tim since you unveiled this work in progress last year (?). So glad I live in NYC. I’m definitely seeking him out for my first tattoo: Geiger’s Pisces mechanoid from the Zodiac Fountain. I feel he’s the only person I would trust to get it right. Congrats on finally having it finished. It’s a beautiful piece! Lamp and DJ Screw, I think. Blood work and pitchfork through a battery of lights. Sorry, weird mood *tips imaginary bottle. * I have a post-it by the computer now that says “insane rambling ? poetry” to remind myself. The question mark was supposed to be a “does not equal” sign. It fits, though. I knew they were by your friend, then forgot for a moment, and remembered again. Anyway, I like Samantha’s photos. They were inspiration for… whatever my first comment here was. I better leave before this gets worse. Crazy people on the internet, I swear. That man is truly talented! Beautifully done. I friggin love you but I think you should put something in the blank space. i have been searching for a photo of this finished piece for longer than i care to admit. i’ve marveled at it for just as long. at times holding the screen as close to my sight as possible, to admire every detail. your artist… is wow. …’tho i’m sure you hear that often.